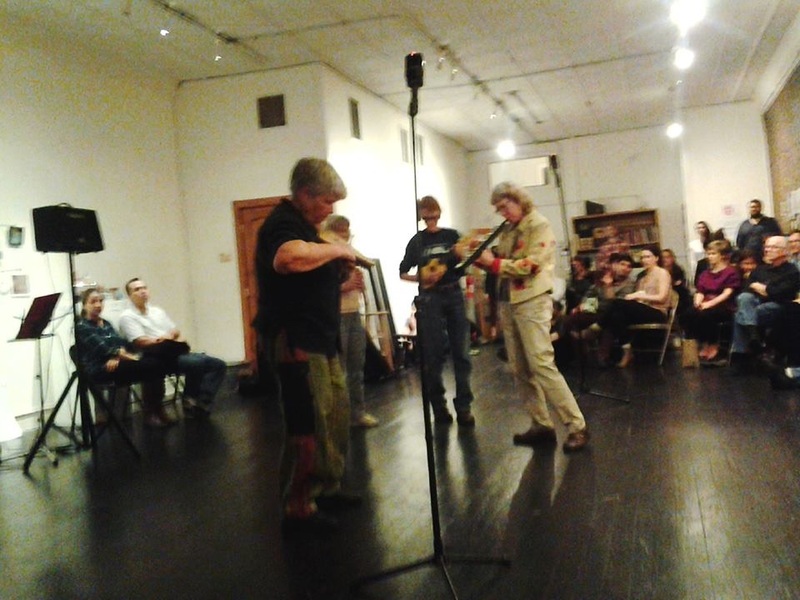 The Prompts event on December 11th was a fantastic mix of dance, readings, music and performance art. All the artists were so fully present and engaged with their material. It was a riveting evening! My cohorts and I set up facing the one brick wall at The Carrack with the windows to our right. (Last post I mis-remembered the interior of the gallery as having two brick walls.) I explained the idea of the Nested Soundscape as containing all the sounds that occur in the environment when we play a scape. I invited the audience to engage with the scape as they were moved, and to allow whatever happens to happen. Then me and my cohorts proceeded to completely fill the sonic environment, leaving NO ROOM for any environmental sounds! The soundscape was sooo loud. WoW! I had the thought to turn it down, and then decided to surrender to what was happening. The room was full of roiling harmonics, bells, brass, flutterings, sirens, wailing and great turmoil. Susanne, Eleanor, Jim, Linda and I moved closer to each other or to a microphone. One intrepid audience member added some vocals. Inside all the loudness, I felt engaged with the scape and my cohorts, so I was satisfied with what we had manifested in the moment. Later in my studio, I was thrilled when I listened to what we had created. My thought was, “That sounds like us.” There was interplay, lots of swirling harmonics, and all the players came forth and receded at times. With 4 pairs of stereo tracks capturing the sound, I could listen to each track and find where certain voices stood out and emphasize that in the mix. Linda plays the uke, and I feared she would be hard to find. There was a place on one track where she is nicely audible, so I gave it some space of its own and amplified it a bit so she is there! Early this year the idea of nesting soundscapes began to take shape. When Susanne Romey and I played at Open Eye Cafe in February, the recording of our session revealed an interesting interplay amongst the amplified digital soundscape, the added acoustic textures that Susanne and I mixed into the scape, AND the ambient noise in the room. (See post at this link http://wp.me/p5yJTY-1N.) Since then I have recorded this phenomenon in the Sun(Ra) Room, in our backyard, and at the Won Buddhist Temple Bazaar that occurred in October. Now we have something like nested dolls with containers within containers! Another aspect of this process is the recording of the soundscape in the space. I am still experimenting with how to record the nested soundscape. Currently, I use 1 to 2 Zoom H2n microphones. These portable digital recorders can record in stereo or surround sound. Recording settings and mic placement are the areas of exploration at the moment. The process of nesting a soundscape allows me to address one of my frustrations in co-creating music with others: the way authority/leadership shuts down expansiveness and breadth of creation. I am saddened by all the beautiful possibilities that get snuffed out due to the limitations of a single creative ear, and the sense of right/wrong this brings to the creative moment. (Once a friend described this process of the singular ear guiding the creative process as the path to “excellence”. I now see “excellence” as the bully stick to keep creation small, controlled, safe and popular.) And yet, my singular ear sculpts the digital soundscape to have a certain sound and movement. There is conceptual intention at work here from my own singular ear. The digital soundscape is where I play with, test, implement and discard sound ideas based on my ear alone. So, how do I get past my own authority? In the creative process, authority can transform into a more fluid vision through surrender. An important element in the creation of a Nested Soundscape is surrendering control over the outcome, the final sound of the piece as a whole. Surrender opens up more possibilites/opportunities for sonic play and exploration. The first step in getting past my own authority is to invite people to improvise over my creations. This approach allows new and different sonic potentials to emerge. I confess I do exercise some control as I direct myself and other players in relation to the scape. However, the soundscape in performance now becomes a collaboration with the creative sensibilities of other players, not just me. I can suggest and point out things after we play, but, in the moment, each player is responsible for the sounds and statements they bring up during the performance. The nest brings in a whole new level of surrender. 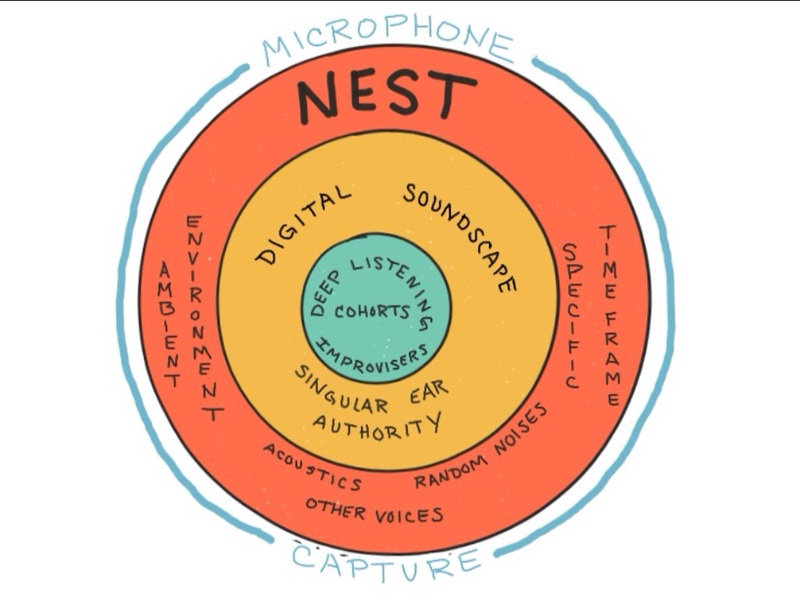 The nest is the contextual “now”, the ambient environment in which the performed soundscape unfolds. The nest brings acoustics, other voices, and other sounds that come with this new container: the space/time where the scape is performed. This is the realm of nearly complete surrender for me. I determine the placement of microphones for recording. I may make some suggestions to people who are present in the environment, but this is not always possible in a public space where people are coming and going. Creating a Nested Soundscape makes me put on my “yes” ears, and challenges me to go with whatever happens: to surrender to all the potentials and possibilities that manifest during the performance in the nest. In the end, I do exert my authority again as I take the recording of the Nested Soundscape and give it shape through audio processing. So, the surrender is incomplete and conditional, as I work to understand how to implement personal creative vision with surrender in the moment. Here is an example of the Nested Soundscape that occurred at the Won Buddhist Temple Bazaar on October 10, 2015. You will hear the vast out of doors container, voices, the rain on my raincoat draped protectively over the recording microphone, and my cohorts improvising within the digital soundscape. The next Nested Soundscape will be created at The Carrack Gallery in Durham as part of Justin Tornow’s Prompts series. 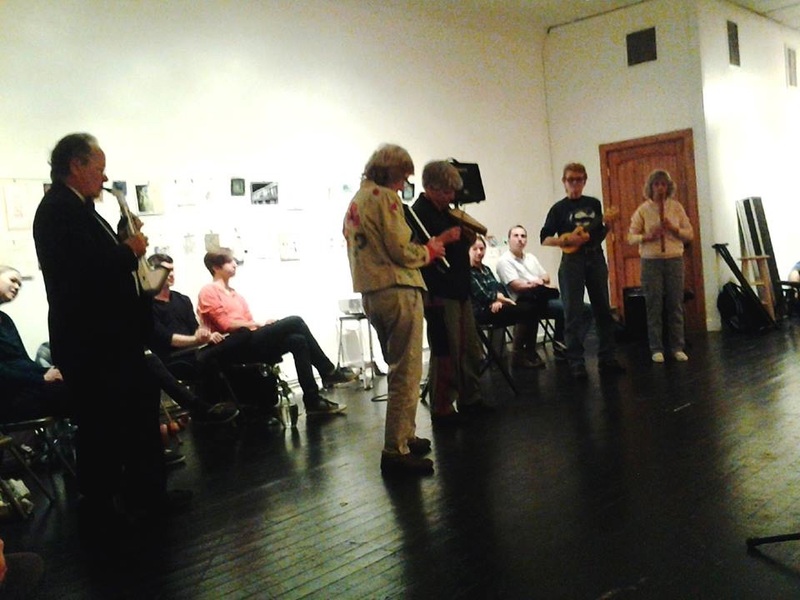 Prompts is a quarterly performance event where artists bring work in response to a one word prompt. For the December 11th event, the prompt is “surrender.” The prompt came through as I was finishing this post. You can see why I had to respond! Collaborating on a weekly basis with the cohorts in the Sun(Ra) Room as we prepare to play at the Won Buddhist Temple Bazaar on October 10th. I record each session, then listen closely to learn what it is we are doing. One thing I hear clearly is that we are playing to the overtones. This can be discerned in the “extra” voices that can often be heard when listening to these soundscapes. The soundscapes themselves stem from my dreams, which are about flowing water and spinning into stillness of late. The form of soundscapes is a swirling vortex. The movement is spinning and flowing. Other worldly overtones get kicked up in the process. For many listeners, soundscapes may feel overwhelming and chaotic. Just as the players must listen their way into the vortex, so the listener must as well. Desire helps fuel this; a wanting to hear WHAT? is going on IN THERE. To “give audience” to the soundscape means to listen INTO the soundscape. And, as with most of lived experience, the less effort the better! Soundscapes are often wild and do not give much direction as to what to listen to. That is the first adjustment for the listener – stop, breathe, find a friendly line and follow it. The line might be a long meandering phrase or a loop, percussion or melody, foreground or background, fast or slow, loud or soft. Often high, fast, foregrounded loops and percussion will grab attention first, so I recommend riding those lines for a short burst and then listening beyond them. Soundscapes make the harmonic bed, the listener chooses whether to lie in it. The listener has to surrender to the vast cave of sound spinning and swirling around. You must be willing to enter. 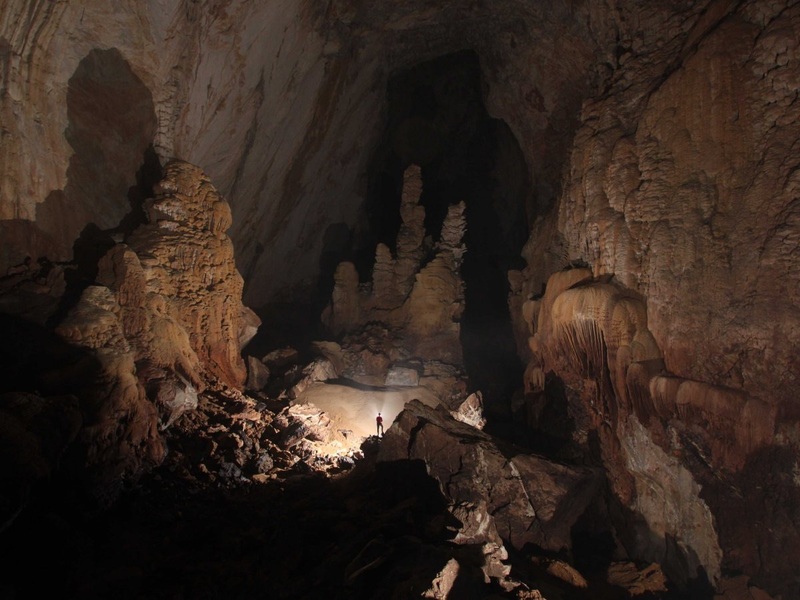 The cave of sound offers footholds that are secure and insecure. Like a bird lighting on a branch, the listener does not know if the center will hold, so deep listening provides the wings to move to another branch. This goes for both tone and rhythm. We explore the fluidity of “in time” and “in tune” as we settle into and are disrupted by the soundscape. Blips and glitches, fits and starts, followed by a deeper sense of the flow of the scape beyond time and tonal center. I learned from Ubaka Hill (the great womyn’s drum teacher, songwriter and performer) about focused and diffuse listening when playing in a drum circle. Pauline Oliveros speaks of these concepts, too. Focused listening is very close into-the-body with attention on some smaller clarity of sound, something distinct and close in proximity, something specific. Diffuse listening is moving away from the body, away from the singular experience. Attention is soft and spread out, appreciating the great swaths of tones and harmonics. Focused listening pays attention to the downbeat; diffuse listening feels the sway of the pulse. Focused listening is compression. Diffuse listening is rarefaction. So the soundscape is this churning, swirling, floating container, and I and my cohorts play in and around it. I think of the soundscape as a beautiful being and we are the accessories. Friend and cohort, Linda Carmichael said soundscapes are like patchwork quilts. We have a bunch of scraps of sounds and we weave them into a whole. Wholeness is the priority, not a preconceived notion of perfection. Or the soundscape is an aquarium and we are the fish swimming and darting around in it. The aquarium metaphor is a great guide to listening to a soundscape. When you watch an aquarium, your eye may follow one fish for a while until the fish passes another one which grabs your eye. Or one fish may make a sudden move that startles you and so you keep an eye on that fish. In this same way, your ear, if it is sufficiently relaxed and accepting, may hear into parts of the scape or moments of improv from the players. Sounds and voices come forward and recede, and your ear, brain and body follow along as you wander through the cacaphonous marketplace of sound. Here is a recording called “Spin Cycle”, which was recorded in the Sun(Ra) Room with me adding in some Fluke strums to drive the vortex of sound. First, you will hear a spinning, pounding pulse driven by bowed strings. The Fluke rides in on top of this white water vortex of sound. The listener can focus on the Fluke strums or spread attention out over the whole soundscape and take it all in. This is the place where overtones can be heard. Listen closely and you will hear people chanting, speaking, moaning. It is my dream to assist our ears in evolving beyond the codification of common practice and popular music. I invite listeners to open the ears as you open your eyes, taking in a broad spectrum of colors, textures, movements. Just for a while, disengage from the notions and expectations of codified form, and allow yourself to enjoy the movement of formlessness into whatever form emerges in the moment. I understand that evolution is scary, we really have no choice. It is happening, so we might as well join in and enjoy it! And – as always, my deepest appreciations for listening! !